With unemployment among Arab youth the highest of any region in the world—climbing above 29 percent in 2014, over 350 leaders and practitioners from civil society, government, and the private sector have gathered in Amman to share innovative and effective approaches to addressing the region’s youth employment challenge. Organized by regional social initiative Silatech and hosted by the International Youth Foundation (IYF), the three-day conference on Arab Youth Employment: Promoting Innovative Solutions to Longstanding Challenges was launched today in Amman’s Landmark Hotel. The conference is being sponsored by the World Bank’s Solutions for Youth Employment Coalition and the Americana Group. 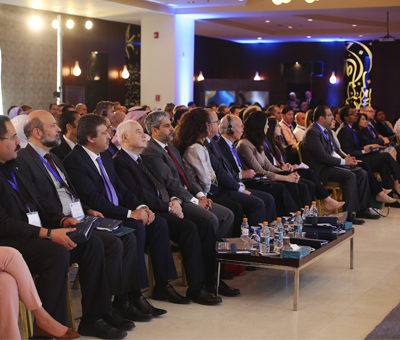 It is also supported by the Jordan Chamber of Industry. The conference will give special attention to the process of developing successful youth employment policies and initiatives, and creating opportunities for practitioners to replicate and grow effective programs throughout the region. During the day’s first plenary session—“Rethinking the Youth Employment Challenge”— HE Dr. Nidal Katamine, Minister of Labor of Jordan, Dr. Omar Razzaz, Chairman of the Board of Directors of Jordan Ahli Bank, and HE Dr. Talal Abu Ghazaleh, Founder and Chair of the Talal Abu Ghazaleh Organization, discussed why the youth employment challenge has been such a longstanding and difficult problem for the region, and ways in which the public sector, private sector, civil society and the NGO community can work together to address the issue. Private sector-driven solutions for scaling up initiatives. Contributing partners leading sessions during the three-day conference include the World Bank, the International Labor Organization, Oasis 500 (Jordan), Tamweelcom (Jordan), Mowgli (UK), Save the Children, United Nations Development Programme (UNDP), Beyond Reform and Development (Lebanon), the Abdul Latif Jameel Poverty Action Lab (USA), Ahead of the Curve (Egypt), Tawasul (Oman), the RAND Corporation (USA), and Future First Global. Furthermore, policy makers from Egypt, Jordan, Iraq, Palestine, and Saudi Arabia are participating in the conference.